We periodically get inquiries concerning areas in tall fescue and bluegrass lawns that are about 12 - 18" in diameter and light green in color. Some people think this is a disease problem such as cool season brown patch. The problem in most instances is Poa trivialis or rough bluegrass. This appearance, that is, the leaves have a tendency to lie flat in one direction. This grass thrives when cool, moist conditions prevail, and when management is high. There is no selective herbicide control. The clumps become less noticeable after the weather warms and the rain stops. Each clump probably originated from a single seed so it doesn't take much seed to cause a problem. It is highly unlikely that the large clumps are the result of recent seeding because the plants would not be that large. Chances are the plants have been present for several years and have gone unnoticed, until the environmental conditions favor its growth. Because tall fescue seed is much larger, seed blends that are exclusively tall fescue do not usually contain Poa trivialis. Rough bluegrass (Poa trivialis L.) is a yellowish-green grass with soft leaf blades which are glossy beneath and have a narrow boat-shaped tip. It spreads by stolons and forms dense, thick patches. 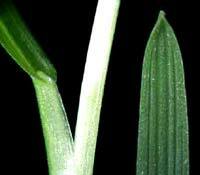 The leaf blades are upright at first, but tend to lay down and mat as the patches become older. Because the root system is shallow, the patches are easily pulled up in tufts or clumps. Rough bluegrass is capable of forming a reasonable turf under certain limited environmental conditions and careful management. It is fine-textured turfgrass developing a high shoot density under cool, moist conditions. It is capable of withstanding a considerable amount of shade if sufficient moisture is present. It is one of the most winter hardy turfgrasses with very good low temperature tolerance. The major weaknesses of rough bluegrass include poor wear, drought and high temperature tolerance. It is sometimes included in a seed mixture with Kentucky bluegrass because of its shade tolerance. However, due to its tendency to produce bright yellow-green patches, it does not blend well with Kentucky bluegrass. 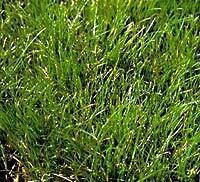 It responds vigorously to fertilizer and irrigation, and under conditions where water is supplied too frequently, it becomes intolerably aggressive and smothers out the Kentucky bluegrass. During July and August patches of rough bluegrass wilt and brown-out markedly unless careful attention is paid to its water requirements. Mowing: Mow at 1" - 2.5"
Fertilizing: Fertilize during the period of active growth (March - June; September - November). Planting: Seed at 1 - 3 lbs. seed/1000 sq. ft. Careful control of the frequency of irrigation. Apply water to the lawn only when the Kentucky bluegrass is showing drought symptoms (turning dark green and the leafblades wilting). The shallow-rooted, drought susceptible rough bluegrass will be under stress, grow less, and be much less competitive. As the rough bluegrass is reduced in vigor, the Kentucky bluegrass will take over as the dominant grass. The reduction of the rough bluegrass by careful control of the watering program will take some time (2 years or more) and the lawn will frequently have a poor appearance as the patches of rough bluegrass wilt, become brown and die out. However, as the Kentucky bluegrass takes over, the lawn will markedly improve. Mechanical removal of the rough bluegrass with a garden rake offers considerable success, especially if done in early spring when the plants are readily pulled out of the moist soil. The rake tines catch the horizontal stolons and pull them out with limited disturbance to the Kentucky bluegrass. For larger areas, a power-driven vertical mower will cut out the stolons. In both cases, the thinning process allows the Kentucky bluegrass to more effectively compete and fill in the invaded areas. Mechanical removal is successful during the initial stages of the invasion when the patches are small (15 cm) and where the lawn contains at least 70% Kentucky bluegrass. When the rough bluegrass occupies 50 to 60% of the lawn area, control solely by this method is difficult. Removal. When the patches become 60 to 100 cm in diameter the rough bluegrass sod should be removed and the section either seeded or sodded. Overseeding thick heavy undisturbed patches of rough bluegrass is difficult and only occasionally successful. Herbicides. At the present time, there are no herbicides available which will selectively remove rough bluegrass from a Kentucky bluegrass lawn. For heavily infested lawns, the homeowner is advised to carry out a complete renovation program. Have the lawn treated with a non-selective herbicide when the rough bluegrass is actively growing. Allow sufficient time for the herbicide to act (10 - 14 days) and then either overseed or resod the lawn.